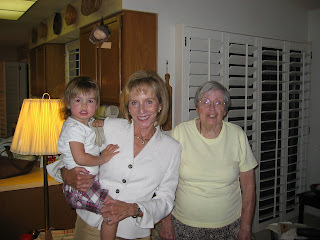 Alex and I are back after a week in Arizona visiting her Great Grandma and Aunt Carol. We had a great time. We went to the pool, park and zoo while we were there. My Grandma has a statue of a dog in her family room that Alex of course just loved. I think he got more kisses than my Grandma or Aunt did! 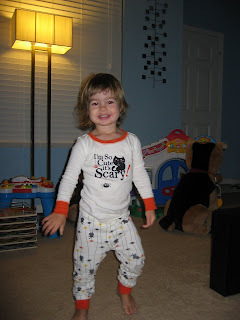 (See the picture at the top of the blog, he also got lots of hugs!) Alex was quite the little helper with my Grandma. After a day or so of seeing me do things for my Grandma Alex wanted to do everything for her, get her mail, her sweater when she was cold, her lunch and breakfast. She wanted to do everything herself for her but I had to insist on helping with lunch or breakfast. I can only imagine what would happen in the kitchen if I tried to let her pour a bowl of cereal! Alex learned some good manners from my Grandma. After a night or two of being there she noticed that my Grandma put a napkin on her lap every night at dinner so she had to have one on her lap every night after that! My Grandma also still prays every night before dinner which I think is wonderful. Unfortunately we don't do it at home. So every evening when we would pray Alex would look at us like we were weirdos. I am doing good, belly is growing every day as it should be. 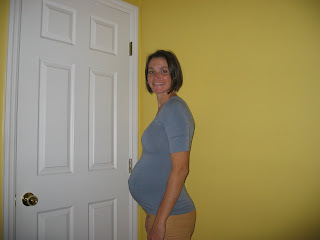 I am 26 weeks along. I can't believe how fast it is going by. He is starting to move around a ton now which I just love. We have decided on a name for this little guy, Johnny Marco Lazaridis. He is already Johnnycakes to me! Alex had a big milestone this week. She peed in her toilet for the first time! I could not believe it, I was screaming with excitement. It only happened that one time this week and probably won't happen for another two weeks but it was still very exciting. 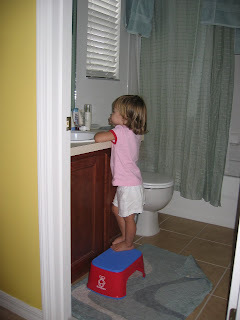 She looked so big sitting on her toilet going to the bathroom. Some other big news is that we finally sold our townhouse! Yeah! It has been two years we have been trying to sell the place. We still cannot believe that we are finally getting rid of it. We are supposed to move into our new house sometime mid-November. Can't wait! 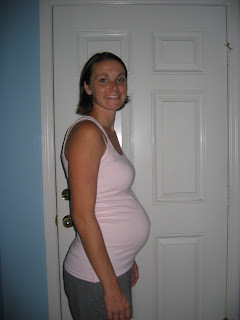 Here I am at 5 months pregnant! 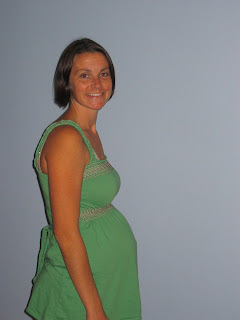 Pregnancy wise there is nothing new to report. Still feeling great. I think I am starting to feel him move a little but I'm not sure since I am not sitting still very much until it is time for me to go to bed at night and I pass out within 5 minutes. Hopefully soon he'll start kicking hard! I love the feeling, its amazing. My parents left yesterday after a long weekend visit. It was great to see them and was very sad as usual to see them go. Although Alex was obsessed with where my Dad was at all times and saying his name, Deetz, she loved playing with my Mom. We will miss them both and can't wait to see them at Thanksgiving.